This spaceborne radar image shows the city of Phnom Penh, the capital of Cambodia. Phnom Penh lies at the confluence of the Mekong River and the Basak Sab. The city was originally established in 1434 to succeed Angkor Thom as capital of the Khmer Nation. Phnom Penh is the bright blue and orange area west of the rivers, near the center of the image. The red, light blue and purple colors indicate differences in vegetation height and structure. Radar images like this one are being used by archaeologists to investigate ruins in the Angkor area in northern Cambodia. This image was acquired by Spaceborne Imaging Radar-C/X-Band Synthetic Aperture Radar (SIR-C/X-SAR) onboard the space shuttle Endeavour on April 15, 1994. The image is 27 kilometers by 27 kilometers (17 miles by 17 miles) and is centered at 11.5 degrees North latitude, 105.0 degrees East longitude. 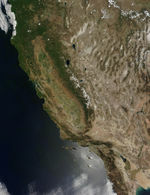 North is toward the upper right. The colors are assigned to different radar fequencies and polarizations of the radar as follows: red is L-band, horizontally transmitted and received; green is L-band, horizontally transmitted and vertically received; and blue is C-band, horizontally transmitted and vertically received. SIR-C/X-SAR, a joint mission of the German, Italian, and United States space agencies, is part of NASAs Mission to Planet Earth.